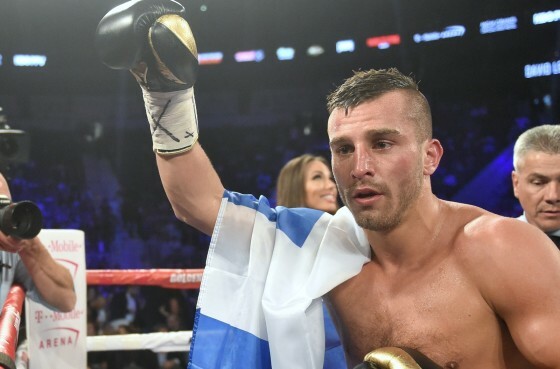 On Saturday night, May 7, former IBF middleweight champion David Lemieux bounced back into the winning column with a dominating 4th round TKO over Glen Tapia inside of the T-Mobile Arena in Las Vegas, Nev. 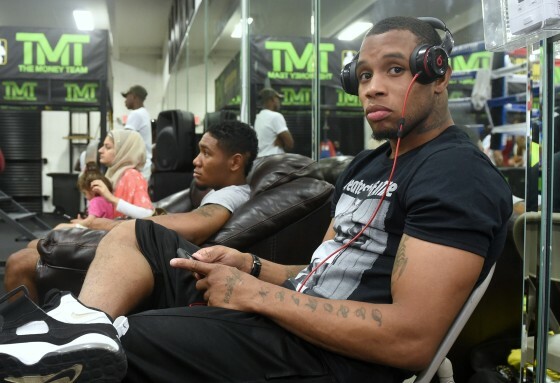 The bout took place on the undercard of Canelo Alvarez’s crushing sixth round knockout over Amir Khan. 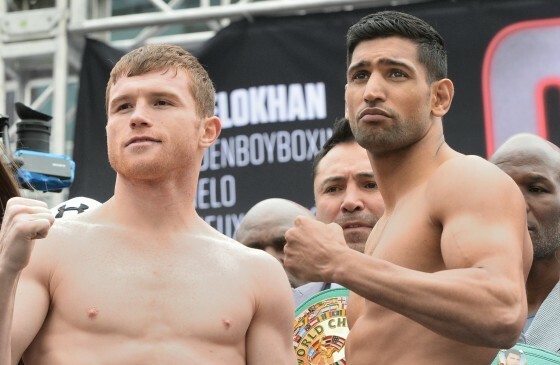 On Tuesday, May 3, WBC middleweight champion Saul “Canelo” Alvarez and former junior welterweight champion Amir Khan made their grand arrival to Las Vegas ahead of their HBO pay per view clash this Saturday night from the T-Mobile Arena in Las Vegas, Nev.
Canelo (46-1-1, 32 KO’s) and Khan (31-3, 19 KO’s) are both exuding extreme confidence ahead of this matchup, although Alvarez is the clear betting favorite to his obvious advantage in size. 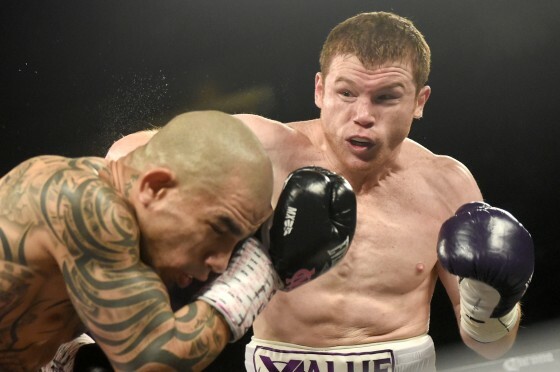 Canelo is coming off of one of his most complete performances to date, as he defeated Puerto Rico’s Miguel Cotto over 12 rounds this past November. 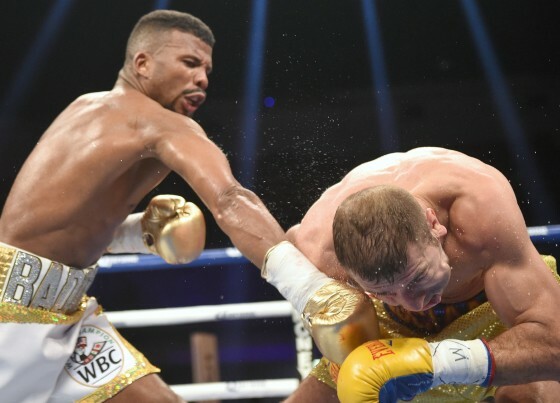 Photos: Badou Jack and Lucian Bute fight to draw in Washington, D.C.
On Saturday night, April 30, WBC super middleweight champion Badou Jack retained his title as he settled for a draw with former longtime IBF titlist Lucian Bute inside of the Armory in Washington, D.C.
Jack (20-1-2, 12 KO’s) appeared to do enough to secure a victory, with one judge giving him a 117-111 edge. That tally was overruled by two 114-114 scorecards, however, as Jack retains his title and could be meeting IBF champion James DeGale later this year in a unification match. 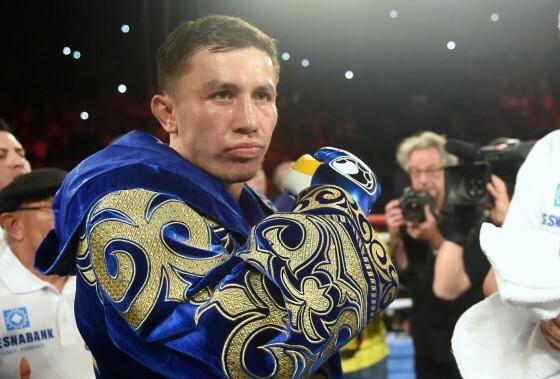 On Saturday night, April 23, WBA/IBF middleweight champion Gennady Golovkin (35-0, 32 KO’s) overpowered contender Dominic Wade (18-1, 12 KO’s) for an easy second round knockout. Golovkin registered a knockdown in the first round off of a big right hand and the writing was on the wall. 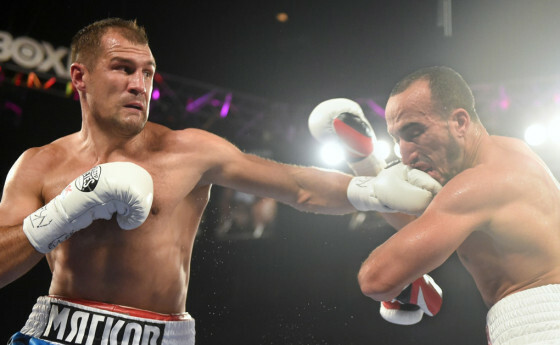 Two more knockdowns followed in round two, and referee Jack Reiss called a halt to the match. During any fight week in Las Vegas you are sure to run into your usual cast of characters. There are a lot of good people in the sport, both in the media and pugilistic field, and it’s good to catch up with everyone during these times. Manny Pacquiao faces Tim Bradley on Saturday night, from the MGM Grand here in Las Vegas, and those in press row have been busy as usual. Our friend Naoki Fukuda has been kind enough to share some of his images through the early fight week days. 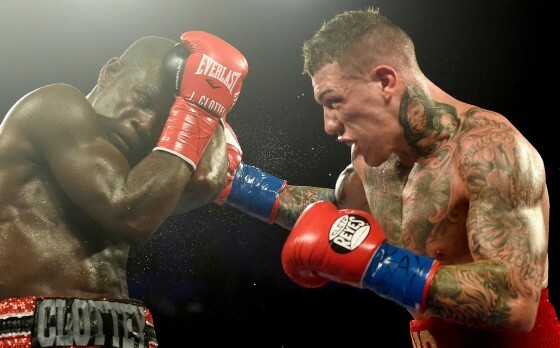 On Saturday night, Dec. 19, Philadelphia’s Gabe Rosado returned to the winning column for the first time in five fights with his ten-round unanimous decision victory over former welterweight champion Joshua Clottey on HBO Latino. 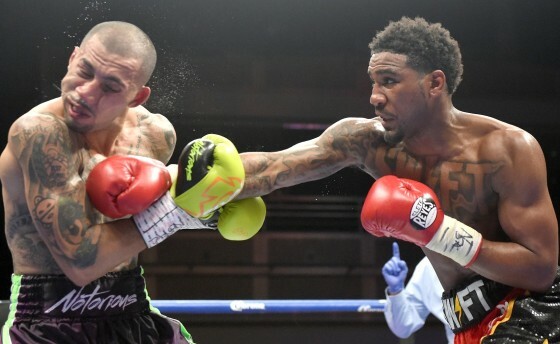 Two scorecards reading 97-93 and a third reading 96-94 were read in favor of Rosado (22-9, 13 KO’s), who was working for the first time under the guidance of trainer and former junior middleweight titlist Fernando Vargas. 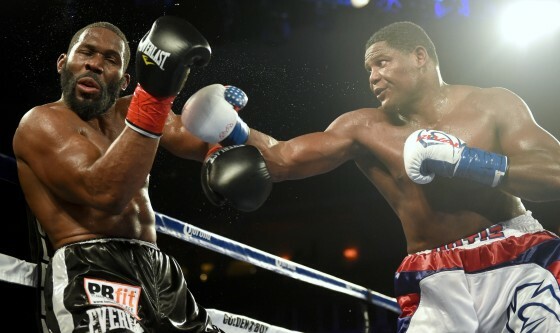 On Saturday night, Cuban heavyweight and interim WBA heavyweight champion Luis Ortiz scored a successful defense of his title with a seventh round knockout of Philadelphia’s Bryant Jennings. 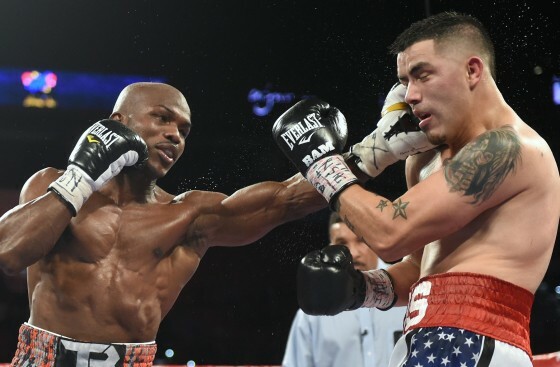 Ortiz was aggressive from the start, leaving an imprint on the first from the first round on, before breaking through and scoring a knockdown and later knockout in round seven. 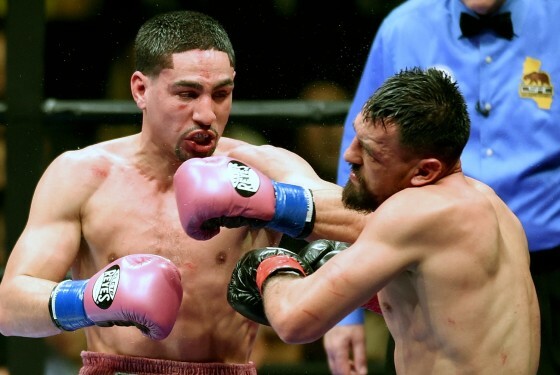 With the win, the 36-year old southpaw improves to 24-0 with 21 knockouts while eyeing the likes of Tyson Fury, Wladimir Klitschko, or Deontay Wilder in the future. 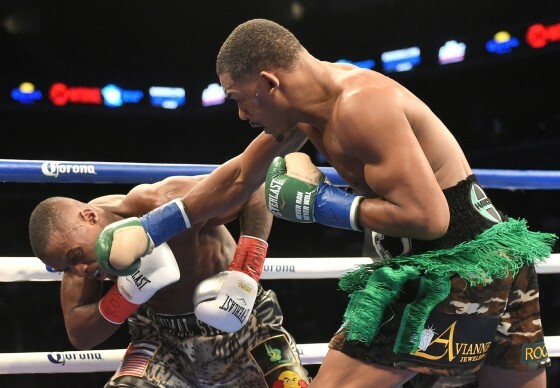 On Saturday night, Dec. 6, WBA middleweight champion Danny Jacobs produced one of the most electrifying performances of the year in halting former titlist Peter Quillin in under one round. 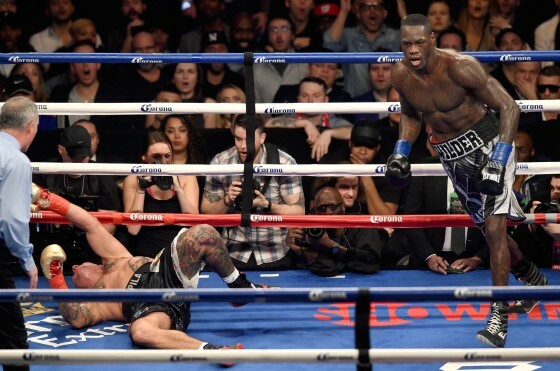 Jacobs (31-1, 28 KO’s) stormed out of the gates and had Quillin (32-1-1, 23 KO’s) in trouble courtesy of a right hand within the first minute of the match. Quillin fought valiantly, but was overwhelmed and saw referee Harvey Dock waive the match off after another right hand blitzed him and had him on shaky legs. On Saturday night, Nov. 21, Mexican superstar Saul “Canelo” Alvarez overcame a stern test from four-division world champion Miguel Cotto over 12 rounds before capturing a unanimous decision inside of the Mandaly Bay Hotel & Casino. Alvarez (46-1-1, 32 KO’s) shined on HBO pay per view, as his poised attack, mixed with his power and sheer size and strength advantages, was a little too much for his 35-year old foe. Cotto (40-5, 33 KO’s) was competitively but was also unable to amount a sustained attack that would have helped turn the tide. 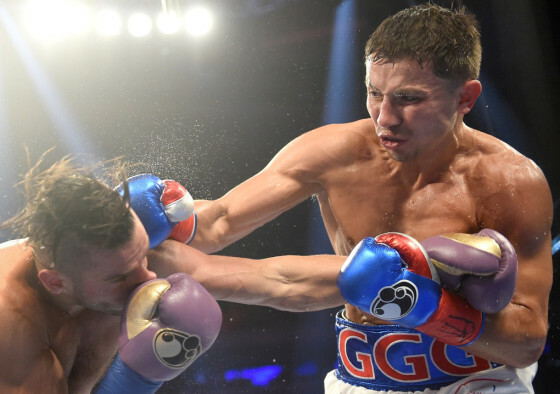 On Saturday night, Oct. 17, Kazakhstan native Gennady Golovkin scored another big victory for his career as he punished former champion David Lemieux for eight one-sided rounds before scoring a TKO victory. With the win, Golovkin adds the IBF middleweight belt to his collection along with his WBA bauble. With this being his first showcase on HBO pay per view, Golovkin (34-0, 31 KO’s) was systematic as he went to work inside of New York City’s Madison Square Garden. Golovkin’s power shots began finding a home early and he was outlanding Lemieux (34-3, 31 KO’s) at a three-to-one ratio as the bout pushed on. 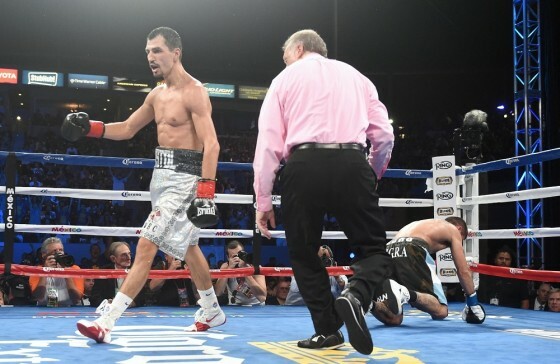 On Saturday night, Oct. 3, inside of the StubHub Center in Carson, Calif., Ukraine native Viktor Postol came away with the biggest victory over his career in stopping Argentina’s Lucas Matthysse in the 10th round of their junior welterweight clash. Matthysse, 33, took the early lead in the HBO-televised contest but it was Postol, 31, who weathered the storm and began controlling the distance and pace of the matchup. Matthysse was always pressing and appeared to rock Postol several times in the seventh round but he simply had trouble dealing with the size and length of his foe. 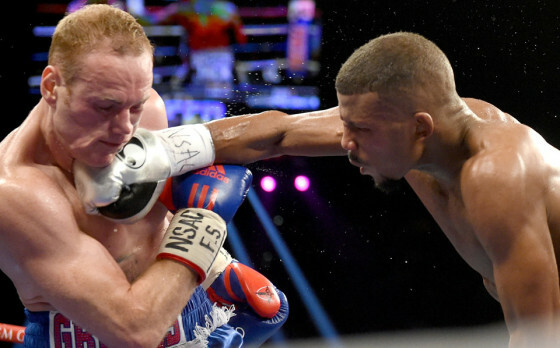 On Saturday night, Sep. 12, WBC super middleweight champion Badou Jack scored perhaps the most impressive victory of his career in out-dueling brash UK contender George Groves over twelve fast-paced rounds for a successful first defense of his belt. The match took place from the MGM Grand in Las Vegas, Nev. on the Floyd Mayweather vs. Andre Berto undercard. Jack (20-1-1, 12 KO’s) scored a knockdown in the first round and appeared to gain the early lead in the face of a determined Groves (21-3, 16 KO’s). On Wednesday, Aug. 26, five-division world champion Floyd Mayweather (48-0, 26 KO’s) hosted the media ahead of his Sep. 12 showdown on SHOWTIME pay per view vs. Andre Berto (30-3, 23 KO’s). 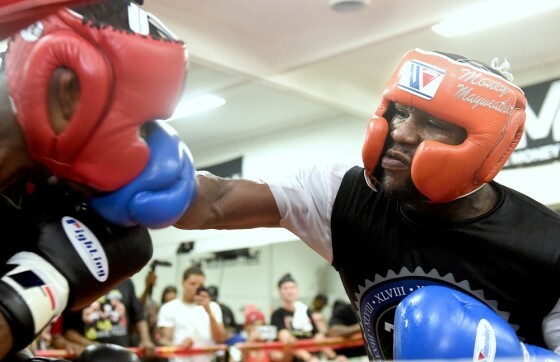 In what may be his final performance in the ring, Mayweather’s media day was a little more laid-back compared to usual, as he engaged in some sparring with stablemates Ramon Montano and “Dangerous” Don Moore. On Wednesday, Aug. 12, award-winning photographer Naoki Fukuda paid a visit to the Mayweather Boxing Club. Fukuda is one of the top photographers in the sport and his work can be found at his personal website Nao Pix. He has captured intimate moments shooting ringside at some of the sport’s biggest events and always keeps a busy schedule traveling throughout the U.S. and abroad.